Marvel Studios is celebrating it's 10th Anniversary this year, and we've already seen some awesome stuff on display. Now, Mondo is getting in on the action, with something that will blow most superhero fans back against the wall. Sure, we've seen the official 10th Anniversary photo shoot and posters. We got Black Panther, Infinity War and Ant-Man and the Wasp in theaters. But nothing will prepare you for the sheer magnitude of what Mondo has planned. 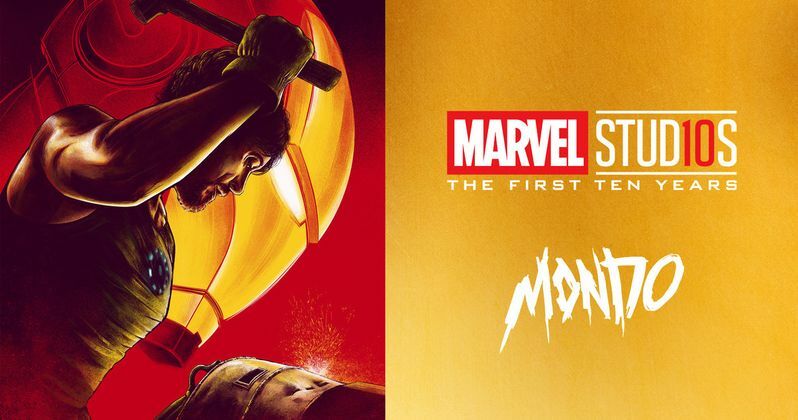 Mondo Gallery is thrilled to announce Marvel Studios: The First Ten Years, an epic celebration of the twenty films to date in the Marvel Cinematic Universe. Featuring new contributions from some of Mondo's most sought after artists as well as previously released pieces on display, the show promises to be one of the mightiest in Mondo Gallery history. Marvel Studios: The First Ten Years kicks off with an opening night reception on Friday, October 12 from 5:00pm - 10:00pm and continues during regular gallery hours, Tuesday - Saturday from 12:00pm - 6:00pm, through October 20. Mondo Gallery is located at 4115 Guadalupe Street in Austin, TX. On Saturday, October 13 from 10:00am - Noon there will be a special Family Day party open to the public, which will include face painting, family photos ops, coffee & baked goods, and more! Costumes encouraged! Said Mondo Creative Director Eric Garza. "As a devourer of pop culture with a heavy lean on movies and comics, the Marvel Cinematic Universe is the ultimate dessert. What Marvel Studios has accomplished over the last ten years is nothing short of remarkable. They've given us heroes that are big and small, mighty and cosmic while telling incredible stories that are often sweepingly epic while at the same time nuanced and personal. We are incredibly excited to celebrate ten years of monumental filmmaking and characters courtesy of the mighty Marvel Studios. Make Mine Marvel!" The show postcard reveals César Moreno's print for the first Iron Man. The striking image highlights an iconic moment of the MCU's first hero building his first suit, laying a foundation for dozens of characters to eventually join Earth's (and the Galaxy's) mightiest heroes in the greatest interconnected universe of films in cinematic history. Marvel Studios: The First Ten Years brings fans an unprecedented artistic and cinematic journey, featuring all new posters and artwork from an incredible lineup of Mondo artists taking on the heroes, villains and films of the blockbuster MCU. Check out the gallery postcard image and a preview of the poster art on display, featuring "Iron Man" by César Moreno. This comes direct from Mondo. Avengers: Endgame Iron Man Figure Reveals Yet Another Spoiler?